This is a list of all the current internship opportunities at the Smithsonian, sorted by unit. Use this list to get a better sense about where you might like to pursue an internship at the Smithsonian, click the links to dig deeper. You can also view all of the Smithsonian’s internships with their deadlines by clicking here. These are centrally funded opportunities that place interns throughout the Smithsonian. Click the links to find out how each program works. The Anne R. and G. Wayne Clough Internship is funded by an endowment given to the Smithsonian Institution by Anne R. Clough and Former Smithsonian Secretary G. Wayne Clough. Awardees of the Clough Internship are appointed based on a demonstrated interest in the pursuit of a discipline being practiced at the Smithsonian and available funds. This internship honors Benjamin Lawless and his legacy as an internationally recognized exhibition planner, designer, Emmy winning filmmaker and writer. The Benjamin Lawless Internship is an opportunity for a rising senior high school student to learn about audience engagement, exhibition design, and research stories associated with objects of all kinds and the people who used and created them. Learn more about this great opportunity here. Focused on students from communities currently underrepresented in the museum conservation field, the Conservation Internship for Broadening Access (CIBA) offers opportunities for current or recent undergraduates to learn about museum conservation conservation. During a 10-week summer program, CIBA interns are placed with mentors in a variety of conservation labs throughout the Smithsonian Institution. The program supports interns by offering a stipend to defray living and travel expenses during the internship. Support for this program was provided by a grant from The Andrew W. Mellon Foundation and is administered by the Smithsonian’s Office of Fellowships and Internships (OFI). The Smithsonian offers internship programs in a wide variety of fields encompassing business and public administration, history, art, science, culture, and education. If you are interested in applying for an internship at a specific museum or office at the Smithsonian, we encourage you to review our website for specific programs offered by our various units in your field of interest. It is necessary to apply for the specific programs separately. However, given the competitive nature of our programs, if you have a broad interest in the Smithsonian, and want to increase your chances of landing an internship, we encourage you to also apply to the General Smithsonian Internship Pool. Smithsonian units who have unfilled mentor-guided learning opportunities may recruit from applicants that select the general pool option. Applications to this program will not be considered for a specific internship program offered at a museum or unit, but may be considered for opportunities that become vacant at various units across the Institution generally. If you are selected for this internship, a Smithsonian unit will reach out to you to gauge your interest and learning objectives against the opportunity they offer. To apply, you can use the Smithsonian Online Academic Appointment System (SOLAA) available through the Office of Fellowships and Internships (OFI) webpage. 2018 I2F Interns learn from Jesus Maldonado, Research Geneticist, at the Smithsonian’s Center for Conservation Genomics at the National Zoological Park. The Smithsonian’s Internship to Fellowship (I2F) Program is a two-tiered learning experience designed to introduce recent college graduates to the diversity of career opportunities within the fields of museum sciences and support. Selected candidates will embark on a 15-week internship in Fall 2018 where they will be placed with a mentor and spend time learning about the Smithsonian, it’s facilities, collections, staff, and it’s role in the global museum and research fields. Successful interns will be welcomed back as fellows in Spring 2019. Fellows will work with their advisor to complete their independent project over the course of their 15-week fellowship. Fellows will also participate in bi-weekly cohort programming that will focus on career skills and planning. The program will conclude with a symposium where fellows will present their work. In 2018, this program is being offered in partnership with the Smithsonian Latino Center (for more information go here) and the Smithsonian Asian Pacific American Center (for more information go here). This program was established in honor of the late James. E. Webb, Regent Emeritus and former Administrator of the National Air and Space Administration (NASA). These learning opportunities are intended to increase participation of minority groups who are underrepresented in the management of not-for-profit scientific and cultural organizations. Interns are placed with mentors in offices, museums, and research institutes throughout the Smithsonian Institution. The Katzenberger Foundation Art History Internship Program is a need-based program supporting internships for undergraduates in research and collections projects at the Smithsonian Institution in Washington, DC. The program is generously funded by the Katzenberger Foundation and administered by the Office of Fellowships and Internships. 6 internships are offered each summer and are all located in Washington, DC, at the Smithsonian’s art museums and archives. Learn more about this amazing opportunity here. The Smithsonian Minority Awards Program administered through the Office of Fellowships and Internships provides undergraduate and graduate students the opportunity to experience the Smithsonian as a universal lens for learning. Under the guidance of Smithsonian staff who are experts in their fields, Smithsonian Interns are inspired to learn, examine and collaborate in their specific academic fields that relate to current research at the Smithsonian. Appointments are offered to students, who are formally or informally related to a Native American community, to pursue internship projects related to Native American topics and using Native American resources at the Smithsonian. Appointments are spent in residence at the Institution’s facilities under the supervision of Smithsonian research and professional staff members. To honor the achievements of DC Public high school graduates and Smithsonian Regents, Shirley Ann Jackson and Robert P. Kogod, the Smithsonian is accepting applications for an internship program named in their honor. These internships are for District of Columbia public high school students who will enter their junior or senior year immediately after completing this summer internship experience. There are two full-time internships. One internship is awarded to a student interested in science and another is awarded to a student interested in the arts. Awarded students spend eight (8) weeks during the summer with their mentors in and around the Smithsonian facilities in the Washington DC area. For more information click here. These are internship opportunities available at each of the Smithsonian’s various museums, research centers, and other units. Click the link for more information about each opportunity, and how to apply. Since September of 2013, the Smithsonian Institute has teamed up with Project SEARCH in partnership with SEEC and Ivymount School, the Maryland Developmental Disabilities Administration (DDA) and the Maryland Division of Rehabilitation Services (DORS). Project SEARCH is a school-to-work transition program for young adults with intellectual and developmental disabilities. To learn more about Project Search, click here. The mission of the Anacostia Community Museum is to explore social issues impacting diverse populations to promote mutual understanding and strengthen community bonds. The museum’s research mission is to examine, document, and discuss these historical and cultural dynamics that are seen and felt at an everyday level. Museum research into issues and themes that resonate within urban communities allows residents to make links and connections between their communities and other urban centers—including pathways to solving shared issues and challenges. ACM brings scholarship and formal research to this inquiry, incorporating the memories and insights provided through first-person accounts. Documentation and research efforts are community-based and include oral history interviews, survey and mapping projects, and community-based collecting efforts. Education and programming is another crucial area of endeavor. Educational programs support major projects, such as exhibitions, and includes conception, development, and implementation of a variety of public educational offerings including lectures, author talks, family art workshops, performances, annual festivals, professional development for students and teachers, symposia, and various off-site cross-collaborative programs in communities within DC, Maryland, and Virginia. You can learn more here! The Archives of American Art offers paid and unpaid internships year-round to students enrolled in undergraduate or graduate programs who wish to learn and gain professional experience in various fields including archival science, information management, museum studies, art administration, art history, and cultural studies. Interns are expected to commit to ten weeks at a full-time schedule. The Claudine K. Brown Internship in Education is funded through an endowed fund in memory of Claudine K. Brown, an educator and influential leader of the Smithsonian. Awardees of the Brown Internship are appointed based on a demonstrated interest in the field of education and museum leadership. Internships are available for high school and college students, including under-served youth. This opportunity offers participants the chance to learn through involvement in a partnership between the Smithsonian and DC Public Schools. To find out more, go here. Internships are offered year-round in the fields of folklore, cultural anthropology, and ethnomusicology. Internships are open to all interested persons looking to further their academic and/or career goals in these or related areas. Intern projects often center on Smithsonian Folkways Recordings, archives and collections, educational outreach projects, Web production and Web content creation, video projects, and planning and production of the Smithsonian Folklife Festival. The internship experience is an opportunity to learn – through hands-on training and one-on-one engagement with knowledgeable staff and professionals in the field – about planning, organizing, and producing large public programs and events; marketing and production aspects of a record label; collections management; research and documentation; and working with information to create multi-media educational products that allow for greater visibility by large audiences. You can learn more about all CFCH internships here! The Peter A. Krueger Summer Internship Program offers college students the opportunity to gain professional skills and learn about museum practices at Cooper Hewitt, Smithsonian Design Museum. Cooper Hewitt is the only museum in the United States that is exclusively devoted to historic and contemporary design. Interns will acquire in-depth knowledge and develop an enriched understanding of how the museum fulfills its mission to educate, inspire, and empower people through design. During the summer, interns collaborate with staff on specific projects and gain experience in the daily operation of their selected department(s). Krueger interns come from a wide variety of academic backgrounds and there are many cross-disciplinary opportunities for students to pursue an interest in design with their major study of education, computer science, digital media, art history, studio art, or the sciences. In addition to their professional activities, interns attend meetings, lectures, and public programs at Cooper Hewitt and travel outside the museum to meet and connect with individuals and organizations that are integral to design and the arts of New York City. Each year a number of undergraduate and graduate internships are available at the Hirshhorn Museum and Sculpture Garden. Internships are offered during the summer, spring, and fall/winter semesters, and academic credit may be arranged through the intern’s school. International students are encouraged to apply. While internships are unpaid appointments, they provide an excellent foundation for future museum work or art-related careers, driven by mentor-based educational experiences. Departments that offer internships include: Curatorial Division, Education Department, Exhibition and Design Department, Conservation Department, Communications and Marketing, Development. You can learn more here! For information on Museum Conservation Institute Internships and Fellowships please click here. The National Collections Program (NCP) is dedicated to improving the overall stewardship and management of Smithsonian collections by providing central leadership, policy oversight, strategic planning, and support of Institution-wide collections initiatives. The NCP serves as a principle advisor to Smithsonian senior management, collecting unit directors, and staff on matters relating to collections management policies, procedures, and standards. Working with Smithsonian senior management, the NCP develops long-term strategies, priorities, policies, and plans that address Institution-wide collections needs. Internships at the National Museum of African American History and Culture offer students and recent graduates opportunities to work closely with professionals and scholars in the museum field. The museum provides a dynamic learning environment and access to supportive mentors that help interns reach their educational and professional goals. Interns can gain practical museum skills and program development experience in a variety of positions from education to collections to public relations. Internship projects are based upon the need and availability of professional staff. Thank you for your interest in interning at the National Museum of African Art (NMAfA)! Internships at the museum are mentor-based, experiential-learning opportunities open to those interested in exploring museum professions. Internships at the museum are mentor-based, experiential-learning opportunities open to those interested in exploring museum professions. Internship opportunities are available in the following departments: Conservation, Curatorial, Development, Editorial, Education, Exhibits, Photographic Archives, Public Affairs, and Registration. For detailed information about each department, please visit the website below. Candidates should have a background in art history, anthropology, museum studies, African studies, or a related discipline. Specific training in African art or other aspects of African culture is highly desirable, particularly for the Education and Curatorial departments. Internships are for a minimum ten-week period and are available on both a full- and part-time schedule. Winter/Spring Application Deadline: November 1. For internships in NMAfA’s Conservation Department click here. Internships at NMNH offer graduate, undergraduate and high school students a chance to learn through mentor-guided experiences in many academic and professional fields. An internship at NMNH is a prearranged, structured learning opportunity under the direct supervision of an NMNH staff member who serves as a mentor. In addition to learning from their mentors, interns may join focused enrichment and social activities. During the summer, we host a series of behind-the-scenes tours, workshops, demonstrations, discussions and group events to provide interns a broader understanding of the natural history sciences, museum education and outreach, and science administration. Arctic Studies Center (ASC) in Anchorage, Alaska. Click here to view a list of internship opportunities currently offered by the NMNH community, as well as contact information for each. Generations of remarkable Americans are kept in the company of their fellow citizens at the National Portrait Gallery. The Gallery presents the wonderful diversity of individuals who have left and are leaving their mark on our country and our culture. Through the visual and performing arts, we celebrate American leaders, artists, activists, and icons of pop culture. They all link us to our past, our present, and our future. The National Portrait Gallery, as part of the Smithsonian Institution, offers formal internships to qualified applicants. A Smithsonian internship is a prearranged, structured learning experience that should be relevant both to the intern’s academic and professional goals and to the professional disciplines represented at the Smithsonian. Various departments at the National Portrait Gallery sponsor interns throughout the year. The availability of internships is dependent upon departmental projects and staff needs, as well as the background, skills, and interest of the applicant; a full listing of opportunities may be found on our website. Projects are based on needs of the department and are agreed upon by the mutual consent of the intern candidate and his or her supervisor. Please see our website to explore the National Portrait Gallery’s departments and how to apply. National Postal Museum Internship The National Postal Museum showcases one of the largest and most comprehensive collections of stamps and philatelic materials in the world. The museum houses six major galleries that highlight a range of topics, from the earliest history of the mail and its rapid growth as a modern enterprise, to the art of letter writing and the beauty and lore of stamps. The National Zoo offers exciting and unique internships that help participants reach a range of academic and professional goals. Internships positions are available from a variety of groups at the Zoo including: veterinary medicine, FONZ, research, and animal programs—each may have a slightly different application process. Applications may be accepted on an ongoing basis or have a deadline. For more information, click here! CURRENTLY, THE OFFICE OF ADVANCEMENT IS NOT ACCEPTING NEW INTERNSHIP APPLICATIONS. PLEASE CHECK BACK ON THIS PAGE FOR A STATUS UPDATE IN SEPTEMBER 2019. Please visit our website here to learn more about our opportunities and how to apply. The Office of the Chief Information Officer (OCIO) provides the Smithsonian’s central computing and telecommunications services; provides leadership in information technology throughout the Institution in support of systems planning and development, communications, and computer-related training; and provides policy and guidance to ensure the integrity and security of Institutional automated data. Internship Programs & Requirements Internships with this office provide practical experience leading to the eventual achievement of personal goals of the interns. Specific interest in computer help desk, electronic mail, programming disciplines, network design and operations. Applicants should have a definite interest in and some knowledge of computers. Information Technology Services Division Interns participate and assist staff with products and services to include technical training, computer help desk, electronic mail and technical support for the Institution’s World Wide Web Site, www.si.edu. This division also operates facilities for hands-on training, document and image scanning, and multi-media product development. Infrastructure Technologies Division Interns in the division have the opportunity to provide foundation computing capabilities, technical support to several mainframe computer systems, network servers operated by OCIO on behalf of offices within the Institution. System Engineering Division Interns will provide central support for the applications systems at the Institution which include acquiring and or developing, deploying and maintaining application systems, providing leadership and guidance in data administration both Institution-wide and in the International Museum Community. Applicants are reviewed by the OCIO Intern Coordinator and division managers. Selected intern(s) are notified by the coordinator. There are no deadlines; the office accepts applications throughout the year. The Office of Equal Employment and Minority Affairs (OEEMA) directs, oversees, facilitates, and reports on all aspects of equal opportunity in the Smithsonian Institution’s employment and business relationships while ensuring compliance with regulatory guidelines and Institutional policies. Interns serving in OEEMA can expect direct interaction with staff on a constant basis and involvement with a wide range of projects, as the work of the office dictates. Past OEEMA interns have gained skills and experience by assisting with projects such as: Editing and creating material for OEEMA’s websites and outreach materials, advocating for increased small business use via the Suppler Diversity program, developing and implementing small business follow up procedures, evaluating small business marketing materials and, updating databases with sources of diverse recruitment candidates and prospective vendors. We expect a great deal from our interns; students interning in OEEMA can expect a challenging and enriching learning experience. Students applying for OEEMA internships must possess analytical and writing skills, the ability to conduct research, and a working knowledge of Microsoft Office. Are Smithsonian OEEMA Interns Paid? Unfortunately interns serving in OEEMA are not paid. Applicants may seek financial assistance on their own from outside sources. Awarding academic credit for an internship is at the discretion of your high school, college, or university. However, we will assist you in providing appropriate information as requested by your school. Arrangements for accreditation should be made before you begin the internship. Be part of the office that makes academic opportunities happen! The Office of Fellowships and Internships (OFI). Our office provides central management for all of the Smithsonian’s academic appointments – internships, fellowships, research associate appointments, and more. As the office that’s dedicated to advocating and coordinating Internships at the Smithsonian, we especially aware of the benefits that mentor-based experiential learning can bring. The Office of Finance and Accounting is responsible for the integrity of the Smithsonian’s internal controls; financial policies and procedures; and the planning, directing and managing of the Smithsonian’s central accounting and financial services programs. The Office of Finance and Accounting is looking for an Associate Intern. For more information, click here. A tax accounting internship with the Office of Finance and Accounting is an opportunity for students with a passion for and curiosity in taxes to gain practical skills and experience. The program offers a part-time fall/spring program in the Crystal City, Virginia office. For more information, click here. The Office of General Counsel (OGC) protects the legal interests of the Smithsonian Institution, a trust instrumentality of the United States. In carrying out that mission, the OGC advises the Smithsonian Board of Regents, Secretary, Under Secretaries, museum directors, and other managers on the administration of the Institution; represents the Smithsonian in litigation and other adversarial proceedings; issues final determinations on administrative tort and personal property claims; drafts exhibition, sponsorship, and licensing agreements; and generally monitors developments in the law for application to Smithsonian programs. The OGC is made up of 12 attorneys, whose work covers such diverse topics as tax, employment discrimination, import/export, federal appropriations, intellectual property, and environmental law. Legal interns in the OGC assist the attorneys in all subject matter areas. The interns work directly with all of the attorneys, performing traditional case law research, preparing legal memoranda for use in briefs and motions, reviewing agreements, surveying state law, and researching legislative history. When possible, interns are invited to attend hearings, depositions, and meetings. It is a small and busy office, and the internship program is fairly informal. We hope that the interns will dive into the work, and, in doing so, expose themselves to an interesting and diverse law practice. You may know us at Smithsonian for our museums and collections, but we’re also a global organization actively involved in researching biodiversity, conserving priceless artifacts, preserving cultural heritage, and much more. We work in more than 140 countries around the world, including China, Armenia, Benin, and Peru, to name but a few. Discover the difference we’re making in communities around the world with an internship at the Smithsonian’s Office of International Relations (OIR). OIR serves as the central point for Institution-wide advice, insight, analysis, and coordination of all international activities of the Institution. OIR’s mission is to leverage the creativity, assets, and expertise of the entire Smithsonian to advance our mission: the increase and diffusion of knowledge. We mobilize communities, scientists, scholars, and partner organizations to exchange ideas and shape creative solutions to the world’s most pressing challenges, always hoping to inspire the next generation of leaders to join us. Underpinning all of our work internationally is a core focus on partnership and building the capacity of peers around the world. OIR offers three different internship roles to support our office in its day-to-day functions. OIR internships provide professional development opportunities for students/recent graduates interested in museum education, community engagement and outreach, curriculum development, communications, cultural heritage preservation, conservation science, and other relevant disciplines. The intern will serve primarily in an administrative capacity. Internships can be taken for university credit. • International Exchange Intern: Facilitating international exchanges across the Smithsonian, including supporting coordination and escorting of international delegations and groups. • Global Projects Intern: Engaging with various members of the OIR team to provide project management support, including proposal development and project implementation activities. • Communications Intern: Supporting digital communications, including content research and creation, and planning, design, and analysis of social media posts. All interns, regardless of role, are also tasked with general office support and administrative activities. This position is designed for a degree-seeking graduate or undergraduate student or a recent graduate. Strong working knowledge of the Microsoft Office Suite, including Excel & Word is essential. Prior international experience (study or work abroad), or in a cross-cultural setting is preferred, as well as experience in an office environment. An excellent command of the English language, as well as strong interpersonal skills, is required. Candidate must also be self-motivated, organized, and detail-oriented. Internships run for a minimum of three months and typically correspond with academic year terms. Internships can be part-time (24 hours per week) or full-time (32 hours per week), depending on intern availability and office needs. Internship is unpaid, with a small stipend intended to offset transportation or other associated costs. To Apply: Please send a cover letter, resume, and references (names and contact information) addressed to Sara De La Torre Beron at global@si.edu, and identify the internship role (or roles) you would like be considered for. The Office of Investments (OI) manages investments and is responsible for the growth, safety, and integrity of the Institution’s financial assets. The Chief Investment Officer provides advice to senior management and unit managers on a range of financial issues, including the investment and management of the Institution’s resources. Learn More here! Smithsonian Organizational and Audience Research (SOAR) – offers highly competitive internships for undergraduate and graduate students. An internship provides experience in conducting qualitative and quantitative studies of the Smithsonian’s audiences, its programs, and its organizational effectiveness. Interns work as collaborators with OP&A staff in data collection, analysis, and presentation of results and have opportunities to pursue topics of personal interested under the guidance of senior staff. A humanities, social science, or museology-related background (art history, sociology, psychology, management, cultural studies, humanities, education, museum studies, etc.) and some coursework in qualitative or quantitative research methods are helpful. Academic credit can be arranged. Applicants are encouraged to review several our reports posted at http://www.si.edu/opanda/ for examples of the types of research and studies the office conducts. If you are interested in pursuing an internship with us, please electronically submit a cover letter, resume, recent course paper, two references and proposed start dates to Claire Eckert and Paul Sturtevant. An internship with the Smithsonian’s Office of Special Events and Protocol provides college and graduate students the opportunity to gain practical skills and experience in the museum field through coordinating and assisting with a vast array of events that can include visits from heads of State, museum exhibition openings, black tie dinners, conference luncheons, opening ceremonies and symposia hosted by the Board of Regents, the Secretary, Under Secretaries, Museum Directors, or other senior staff. Working closely with the Special Events and Protocol staff, interns will gain experience in formulating, developing and executing all programmatic and logistical elements of assigned events. Other specialized areas for interns to explore include budget preparation and reconciliation, contracts, event management, public relations, problem solving and diplomacy. Participating interns can spend up to ten weeks during the course of their study working in the Office of Special Events and Protocol as well as any of our other area Smithsonian Museums, Research Centers or off-campus facilities. Candidates for an internship in the Office of Special Events and Protocol must be current college or graduate students with a 3.0 GPA or higher. The Office of Sponsored Projects (OSP) provides assistance to Smithsonian staff who are seeking or have obtained external funding for sponsored project(s). A “sponsored project” is a research, education, exhibit, training or other activity that receives partial or full funding through the mechanism of a federal or non-federal grant or contract. OSP assists with the acquisition and usage of grants and contract funding for Smithsonian research, education and training. Assistance is provided to Principal Investigators, administrative units and central management staff. Principal administrative functions of the office include advising on funding sources and availability; assisting with proposal preparation and submission, including meeting sponsor and Smithsonian requirements and development of the budget; reviewing and negotiating the terms and conditions of a proposed award and accepting the award on behalf of the Institution; and providing advice and assistance in development of the Institution’s research policies. In addition, federal research compliance policy (e.g. use of animals or human subjects in research) is developed and monitored by OSP staff. Training programs in all relevant areas are provided to Smithsonian staff on a regular basis. Accounting/financial functions include monitoring sponsored project activities and expenditures to assure compliance with Smithsonian and sponsor policies and accounting standards; providing oversight for cash management of all grants and contracts; providing advice and problem resolution services to principal investigators; serving as the official Smithsonian audit liaison with auditors of government agencies and private foundations and corporations for grants and contracts. The office is also responsible for preparing, negotiating and applying the Smithsonian’s indirect cost system for grants and contracts. There are currently no open internship opportunities at the Office of Visitor Services. About Us: Smithsonian Affiliations offers internships focused on national outreach based on availability and current activities of the staff. Projects vary in focus and intensity and range from short-term, part-time appointments to full-time summer-long commitments. Working side-by-side with the Affiliations staff, interns develop specialized skills in content marketing, web management, new media strategy, public relations, national conference planning, membership management, and fundraising. In addition, interns will develop professional networking skills while working collaboratively among the various Smithsonian museums and units to learn how to develop educational programming and coordinate object loans for Affiliates across the country. To learn more about SA’s internships and how to apply please click here. Since 1968, the Smithsonian American Art Museum’s internship programs have provided instruction and inspiration to hundreds of graduate and undergraduate students, as well as others seeking self-enrichment. Former interns have achieved success in professional positions in the art and museum fields, both nationally and internationally. The Smithsonian American Art Museum offers two internship programs to coincide with the academic calendar. The Advanced-Level Program takes place during the fall and spring semesters; the eight-week Summer Program begins early to mid-June. The Smithsonian Astrophysical Observatory hosts two independent summer Research Experiences for Undergraduates (REU) programs, one in Astronomy, and one in Solar Physics. Details of both programs can be found below. The Smithsonian Astronomy Summer Intern Program is a 10 week Research Experiences for Undergraduates (REU) program where students work on astrophysics research with an SAO/Harvard scientist. Potential areas of research include Galactic and extragalactic astronomy, stellar astrophysics, interstellar medium and star formation, supernovae and supernova remnants, laboratory astrophysics and astrochemistry, instrumentation, planetary and atmospheric science, and cosmology. In addition to each intern’s individual research project, there are field trips, professional development discussion meetings on topics including the responsible conduct of research, graduate school life, graduate school application process, graduate fellowship funding, and career opportunities outside academia, and a summer colloquium series. Students are also given the opportunity to present their research results at the January meeting of the American Astronomical Society following their summer in residence. Undergraduate students interested in a career in astronomy, astrophysics, physics or related physical sciences are encouraged to apply. Applications from women, members of underrepresented groups and students from colleges with limited opportunities are especially welcome. Students are expected to be in residence at the Harvard-Smithsonian Center for Astrophysics in Cambridge, MA for the duration of the program. For more information, descriptions of previous years activities and research projects, and to apply please see our website: http://hea-www.harvard.edu/REU/REU.html. Eligibility: US citizen or permanent resident (green card holder) enrolled in a degree program leading to a bachelors degree. Seniors who graduate on or before June 2015 are not eligible. The Solar and Stellar X-ray Group (SSXG) and the Solar, Stellar, and Planetary Group (SSP) at the Harvard-Smithsonian Center for Astrophysics (CfA) hosts a 10 week summer program for undergraduate students across the country to participate in cutting edge research on solar physics with CfA/SAO scientific mentors. Special seminars will be held to increase students’ public speaking and computer programming skills. Students will learn from experience about scientific research and how to apply their academic work to real-world problems. Participants must be US citizens and full-time undergraduate students, preferably finishing their sophomore or junior years. Applications from traditionally underrepresented groups are encouraged. Housing, stipend, and subsidized travel expenses to Cambridge are provided. More information including contact and application information can be obtained from the website listed below. Stipend: $500 per week; housing and travel to and from SAO are also subsidized. Dust plays an essential role for the Martian atmosphere, and dust storms range from a local to a global scale. The Mars Global Surveyor (MGS) and Mars Reconnaissance Orbiter (MRO) have kept a nearly continuous daily global record of Mars since 1999, providing a unique opportunity to study Martian dust storms. This internship will allow a student to collect data on dust storms by using satellite images. The intern will gather information about storm location, time, morphology, texture, and other characteristics. They’ll also be taught how to analyze the data, so that they can learn about the spatial temporal distributions of various types of dust storms. The overarching goal is to understand more about how Martian dust storms work, which can be very helpful in planning future Mars missions. The intern will get the opportunity to learn about research while contributing to this goal. The Air Quality Data Analysis team at SAO is a world leader in the measurement of a variety of trace gases in the Earth’s atmosphere from satellites and airplanes, using backscattered solar ultraviolet and visible radiation. They’ve developed algorithms for the retrieval of ozone, nitrogen dioxide, bromine monoxide, formaldehyde, water vapor, glyoxal, and sulfur dioxide. These gases are produced from a variety of natural and manmade sources, including the burning of fossil fuels, industrial production, volcanic activity, biogenic byproducts and biomass burning. The team has produced products from instruments on NASA and European meteorological satellites, as well as instruments flown on NASA’s research airplanes. This internship will teach students how to analyze the spatiotemporal distributions of trace gases. For example, an intern might analyze OMI and OMPS products over Central America to determine spatial patterns in the distribution of formaldehyde. Their findings would then contribute to the team’s plan of taking remote sensing measurements of trace gases in the Panama Isthmus, which is part of a new Grand Challenge Award between SAO and STRI. Interns will also gain hands-on experience in real scientific collaboration, and further their understanding of atmospheric physics and chemistry. The Smithsonian Center for Learning and Digital Access (SCLDA) creates models and methods that make the Smithsonian a digital learning laboratory for everyone. SCLDA’s primary audience is learners who connect with us through digital technologies for informal learning experiences, which are linked to formal education. We provide extensive digital access to Smithsonian collections and programs to inspire personal exploration. Interning at the Smithsonian Learning Lab is a unique opportunity to be part of a new way the Smithsonian is making its resources more accessible and useful to teachers, students, parents, and anyone thrilled by the discovery and exploration of museum resources. As an intern with us, you’ll be a formative part of an inviting educational movement, as we open the doors to the vast resources within the Smithsonian to anyone with an interest to learn. This is not a museum education department or public programs internship, and takes place mostly within an office setting. Students studying new media, digital learning, museum education, and evaluation methods are encouraged to apply. Smithsonian Enterprises operates retail, media, product development, licensing and other services which promote the Smithsonian mission while generating an essential source of unrestricted funding for the Institution. By providing products and services that reflect the mission of the museums and research centers, Smithsonian Enterprises plays a critical role in advancing the Institution’s core mission of the increase and diffusion of knowledge. Smithsonian Enterprises includes Smithsonian and Air & Space magazines, museum stores, restaurants, IMAX theaters, Smithsonian Catalogue, Smithsonian Channel, book publishing, licensing, online and digital enterprises. The Smithsonian Environmental Research Center’s (SERC) Internship Program offers undergraduate and beginning graduate students a unique opportunity to gain exposure and experience in a research environment. The program enables students to work on specific projects under the direction of the Center’s professional staff and is tailored to provide the maximum educational benefit to each participant. SERC is focused on understanding the causes and consequences of environmental change for marine, freshwater, and terrestrial ecosystems. Interns at SERC conduct independent projects (field of research and education) over 10-16 weeks, utilizing our 2,650 acre research site on the shores of the Chesapeake Bay to provide novel insights into some of the most profound issues challenging our world today; including habitat loss, climate change, and invasive species. Students will become familiar with much of the research being conducted at SERC, but they will devote most of their time to a project and content area of particular interest to them. In addition to their research, students participate in field trips, seminars, and lectures. All participants are expected to integrate what they have learned during their experience and present a brief seminar at the end of their appointment. Contact : Daniel E. Gustafson, Jr.
Smithsonian Institution Exhibits (SIE) supports all the museums and units at the Smithsonian in the design and production of exhibits. Interns work under the guidance of SIE staff and are assigned to work on tasks appropriate to their qualifications and talents. They have the opportunity to exercise and strengthen their existing skills, develop new skills, and exercise responsibility and creativity within a supportive, encouraging environment. SIE’s departments are Design, Graphics, Fabrication, 3D Studio, Exhibit Planning, and Administration. Deadline: Applications accepted year-round, except for our summer intern program, February 15 is the deadline. To see all Smithsonian Garden (SG) internships please click here. 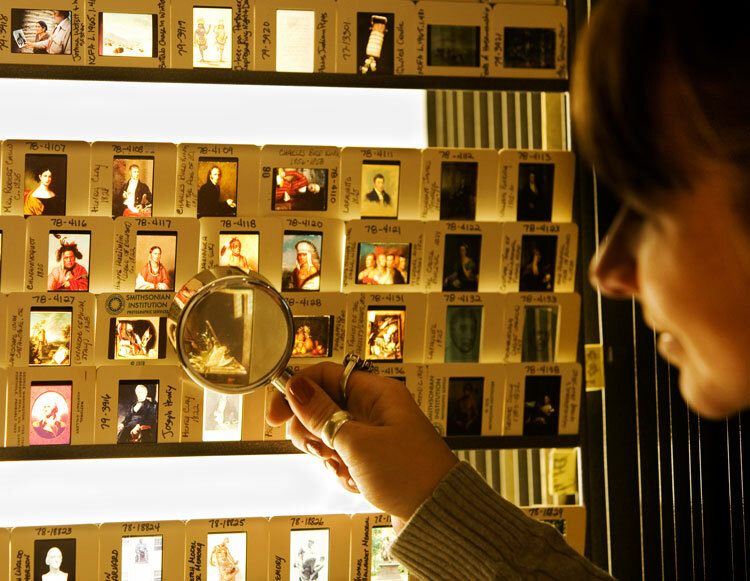 The Smithsonian Institution Archives offers internships in archival methods, institutional history, oral history, history of science, collections management, collections care (preservation and conservation), digitial preservation and curation, and electronic records management. The Archives Division serves as a repository for documents of historic value about the Smithsonian, as the official memory of the Smithsonian and as a resource for scholars. Internships are provided for arrangement and description of institutional records, personal papers, and photographic and other collections in special media; encoding of finding aids for its website; digitization of collections; and conducting records surveys and developing records disposition schedules. These internships are considered apprenticeships under the tutelage of an archivist. The Institutional History Division conducts research on the history of the Smithsonian, prepares scholarly and popular publications, exhibits, lectures, electronic and paper guides to specialized research areas, and records oral history and video history interviews. Internships provide an overview of the research and dissemination activities of an institutional history program, with a focus on specific topics. Prior course work in American history or the sciences is desirable, though not a prerequisite. The Collections Care Division carries out preservation of collections in paper, photograph, and audio-visual formats. Preservation internships provide hands-on experience in preservation techniques, working with nineteenth and twentieth century Smithsonian records and personal papers of prominent administrators and scientists. The internships emphasize integrated preservation management, considering issues such as proper environment, housing, handling, and preservation reproduction of records. Conservation internships are occasionally available for current students of masters programs in conservation or post-graduates. The Digital Services Division preserves and manages the digital collections of the Archives. This work spans a wide range of activities including: digitization of photographs, documents, sound, and moving images; preservation and curation of original electronic records; facilitating access to digital collections; and digital repository management. All internships provide hands-on experience and exposure to key issues in archival digital collections such as digital obsolescence, authenticity and provenance, conservation, and sustainability. Interns will work directly with records from the Archives’ collections in digital and other formats. The Smithsonian Institution Libraries offers internship opportunities to graduate students, library professionals, and undergraduate students interested in exploring a library career in library and information science. Intern assignments may include a project or a structured practical experience. The Libraries selects interns based on its needs and on the specific education, training, skills, and interest of the applicant. While specific requirements may vary from project to project, a graduate student in library and information science, or an intern with library experience or subject expertise may participate in reference or interlibrary loan activities, creation of bibliographies, or cataloging projects. Undergraduate interns receive an over-view of library functions such as reference, circulation, acquisitions, cataloging, or preservation, and may assist in organizing collections, processing gift and exchange materials, or proofing and keying data. Internships are available in all of the Libraries’ divisions: Readers Services and Strategic Planning with its 22 branch libraries, Technical Services and Administration, and Digital Library and Information Systems. The lengths of internships vary, and the minimum length of an internship is one month. Stipends are offered for certain projects and funded internships may be available through the Smithsonian’s Center for Museum Studies and the Smithsonian Office of Fellowships and Internships. SITES organizes and circulates exhibitions to museums and other host venues around the U.S. The program includes exhibitions on art, humanities, and science. Exhibitions originate at the SI, but SITES also travels exhibitions from other, non-SI museums. Internships are available in exhibition development, public relations, education, registration, exhibit scheduling, public affairs, museum administration, and editing. Graduate students and visiting professionals preferred. Please note that we do not offer stipends. The Smithsonian Latino Center is the division of the Smithsonian Institution that ensures that Latino contributions to art, science and the humanities are highlighted, understood and advanced through the development and support of public programs, scholarly research, museum collections and educational opportunities at the Smithsonian Institution and its affiliated organizations across the United States and internationally. The Center offers academic internships for upper level high school students, undergraduate, and graduate students during the fall, winter/spring, and summer semesters. Interns can experience hands-on opportunities working within the exhibitions and public programs, education and outreach, web and virtual immersive education, development, and marketing departments. For more information on internships at the Smithsonian Latino Center please email: SLCEducation@si.edu. One of the SLC’s most prominent internship programs is the Young Ambassadors Program (YAP). YAP is a national program for graduating high school seniors aimed at fostering the next generation of Latino leaders in the arts, sciences, and humanities via the Smithsonian Institution and its resources. YAP is a college preparatory and leadership program encouraging participants to explore various academic and career opportunities through the lens of the Latino experience. Students with an interest in and commitment to the arts, sciences, and humanities as it pertains to Latino communities and cultures are selected to travel to Washington, D.C. for a week-long seminar at the Smithsonian Institution. This enrichment opportunity is a leadership development and skill-building training conducted by renowned experts in their respective fields. It exposes youth to a wide array of academic disciplines promoting higher education and encouraging youth to explore and understand Latino identity and embrace their own cultural heritage through visits to the Smithsonian’s Latino collections and one-on-one interaction with anthropologists, artists, curators, historians, scientists and other professionals. Following the training seminar, students participate in a four-week interdisciplinary education internship in museums and other cultural institutions in 16 regions across the United States and Puerto Rico, including Smithsonian-affiliated organizations. This hands-on component allows students to gain transferable knowledge and apply the skills acquired during the training seminar to their internship assignments. Smithsonian Organization and Audience Research (SOAR) – offers highly competitive internships for current and recent undergraduate and graduate students. An internship provides experience in conducting qualitative and quantitative studies of the Smithsonian’s audiences, its programs, and its organizational effectiveness. Interns work as collaborators with SOAR staff in data collection, analysis, and presentation of results and have opportunities to pursue topics of personal interested under the guidance of senior staff. A humanities, social science, or museology-related background (art history, sociology, psychology, management, cultural studies, humanities, education, museum studies, etc.) and some coursework in qualitative or quantitative research methods are helpful. Academic credit can be arranged. Applicants are encouraged to review several our reports posted at http://www.soar.si.edu/reports for examples of the types of research and studies the office conducts. If you are interested in pursuing an internship with us, please electronically submit an application through SOLAA here. Also, please be sure to include, in your SOLAA application, a cover letter, resume, recent course paper, two references and your proposed start dates, addressed to Claire Eckert and Paul Sturtevant. The Smithsonian Science Education Center (SSEC) works to improve the teaching and learning of science for K-12 students throughout the United States, and ultimately, throughout the world. It develops innovative new curriculum, conducts Summer Academies for Teachers at the Smithsonian museums and labs, and fosters science education leadership among school and community leaders. Internships are for 10 weeks during the summer. Fall and Spring internships are reviewed on a case-by-case basis and are subject to the student’s schedule and the availability of assignments. Areas of Study: Students who have an interest in science, education, or business will find our work most engaging. We encourage minorities to apply. Term: 40 hours per week for 10 weeks during the summer. Student must be available the entire internship. Stipend: Stipend amount is subject to available funding. Deadline: Application is open January 1st and closes March 15th of every year. The Douglas M. Lapp Endowment Internship in Education is funded through an endowed fund in honor of Douglas M. Lapp, the first Executive Director of the National Science Resources Center (NSRC), now named the Smithsonian Science Education Center (SSEC). Awardees of the Lapp Endowment Internship are appointed based on a demonstrated interest in the field of science education. Internships are available for graduate students only who are interested in pursuing a career in the communications, marketing, or public relations fields. Adult Education Programs: Assist with all aspects of programming including researching and booking presenters, marketing, logistics and event implementation. Development: Support the Development Office through creating marketing materials, drafting grants and sponsor proposals, maintaining website text, and conducting research on funding sources. Discovery Theater: Support the Discovery Theater staff in all aspects: house management, ticketing and group sales, education, administration, and production support. Digital Marketing: Support the Marketing staff by editing images and deploying eCommunications, as well as using web analytics software to research results from marketing campaigns. Film Production: Assist the Marketing Department by creating promotional videos and video clips for different audiences. Performing Arts: Assist with research, booking, budgets, logistical set-up, and marketing of events. Provide program during programs, including box office and house management duties. Sleepovers: Provide hands-on support with the design and production of museum educational materials, logistics, volunteer coordination, plus on-site oversight at sleepovers. Social Media: Create new content and research content to publish on Associates’ Blog, Facebook, and Twitter accounts. Special Events: Provide promotional and programmatic support for large scale public events, and assist with general event planning as well as social media outreach. Studio Arts: Provide program support for course workshops and content for the Studio Arts blog, Studio Arts landing page, and Facebook page. Summer Camp: Support the team by assisting with the daily running of the 9-week camp program, supervising campers and assistants, up-keep of rosters and paperwork, parent communication, and supply organization and procurement. Credit: College or university credit may be awarded by the student’s sponsoring institution through advance agreement with student’s college/university and Smithsonian Associates. The National Science Foundation funds a number of research opportunities for undergraduates through its Research Experiences for Undergraduates (REU) Program. The Smithsonian Institution supports six REU Sites at various museums and research centers around the world. Exciting research internships are offered in a range of fields including biology, ecology, environmental science, paleontology, archaeology, astrophysics, and museum conservation science. All REU programs accept interns for the summer months and offer stipend support; some offer room and board. Interns must be currently enrolled undergraduates. Interns in the REU programs must be U.S. citizens or permanent residents, although some programs offer concurrent support for non-U.S. citizens. Everyone is encouraged to apply! Please visit this page for specific information about the programs, application instructions, deadlines, and requirements.